Architects Falconer Chester Hall saw five projects successfully through Liverpool City Council’s Planning Committee today for a variety of clients. Amongst these is the final piece of the Wolstenhome Square redevelopment project, to be known as The Address, which will see 200 apartments created in a new building on Seel Street. Today’s consents bring Falconer Chester Hall’s total approvals up to 14 in the last four months alone, a reflection of how busy the practice is at present. `Liverpool is still seeing plenty of interest from developers as new residential districts emerge such as those to the north of the city centre. `The ongoing volume of work has seen us invest further in our Liverpool base in order to both attract and retain staff,’ said Managing Director Adam Hall. The Seel Street development, for Elliot Group, will include the demolition of an existing two-storey building to be replaced by a high-quality residential building of between nine and 11-storeys. The 200 apartments will be a mix of studios, one and two-bedroom units, with a gym, spa and an outstanding communal rooftop garden with views towards the river. Two commercial units at ground level will contribute to the vibrancy of the Ropewalks area both day and night. 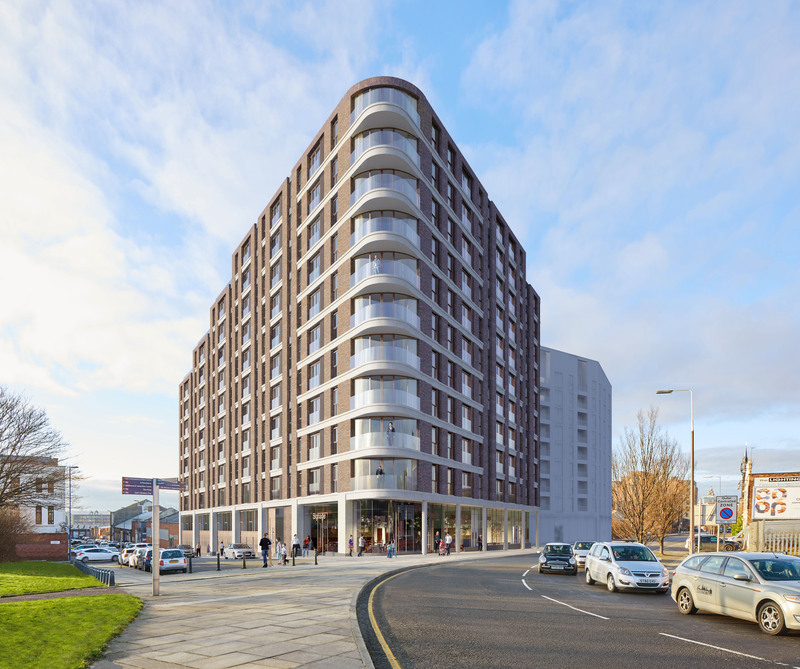 Another substantial scheme gaining approval is a 217-apartment development for Citipads on a site within the Baltic District bounded by St James Street, New Bird Street and Greenland Street. The St James Street development also includes ground floor commercial space which has been configured to allow for use as studios/workspaces to meet the need for such facilities within this creative industry quarter. The building will be between nine and 12 storeys with external amenity space at the upper ground and roof levels, and will be a mix of studio, one and two-bedroom apartments. At Clegg Street, proposals for new build residential accommodation of 97 apartments incorporating a mix of one and two bedrooms, stepping up from five storeys to eight were approved. The scheme, for Caro Developments, will enhance its location by replacing a dilapidated building and providing an active frontage. A series of ‘steps’ into the Great Homer Street façade result in external space for the residents which will host views across the city. Seventeen apartments will be contained in a two-and-half-storey building at the junction of Warbreck Moor and Hall Lane in the Fazakerley area of the city. Accommodation with the development would be split between 10 two-bedroom and seven one-bedroom apartments. The site is currently vacant and has been used for informal car parking. Under proposals from Collateral UK, the new building would have a curved frontage providing visual interest at a prominent corner site. Falconer Chester Hall assisted with the addition of an extra storey to a building under construction by AC Parl Ltd on Parliament Street, again within the Baltic Triangle district. This increased the number of apartments to 56 from the previously consented 44, with the proposals filling in the hitherto stepped back fifth floor and adding a sixth occupying the same footprint.